Being a petrolhead, I usually make the pilgrimage to Jerez de la Frontera each year when the Moto GP rolls into town. There´s always a fantastic atmosphere on race weekends, with more than 120,000 fans (mostly arriving on motorbikes) making their way to the motor racing circuit just outside the city. The roads along the route to the circuit are perfect for motorbike riding, and I never fail to be amused by the roadsigns warning bikers that they may come up behind slower moving cars! This entry was tagged Andalucía, Europe, life, Moto GP, motorcycles, photography, Post a week, Spain, travel, Travel theme, Weekly Photo challenge. Bookmark the permalink. Ha ha, funny sign. 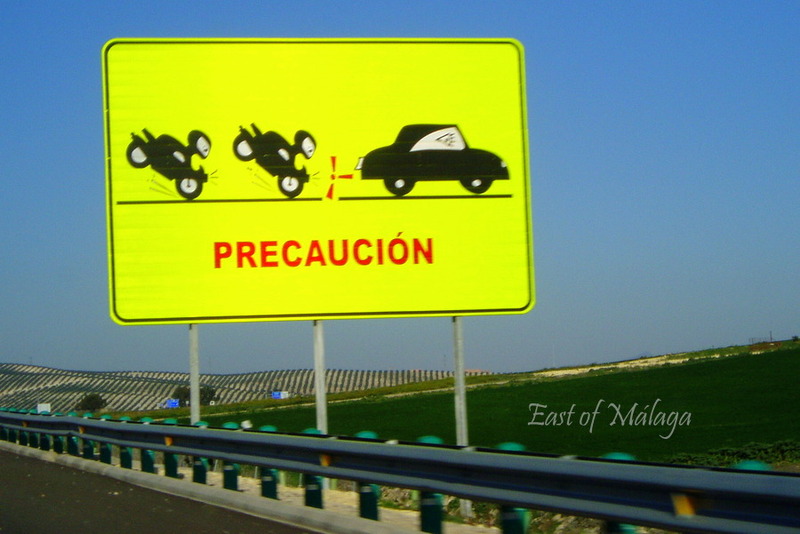 I think that sign would cause more accidents than the cars, because everyone would turn to look at it. Yes, it´s a real head-turner, isn´t it? Someone suggested the riders look like ninjas – and I agree! Warning! Ninjas on motorcycles! Funny sign. It always makes me smile too, Marco! Oh yes, often the picture says a 1000 words, he he – stupid, amusing and otherwise. Yes, I do too. You can´t help but see it! Do you know the dates for F1 testing at Jerez next February? Or do you only go for the motoGP? OH not only Moto GP – F1 too! According to Planet F1 http://www.planetf1.com/driver/3213/7967708/No-in-season-test-in-2013 there will be four days of winter testing at Jerez, beginning on Feburary 5th 2013. I went a couple of years ago to an F1 testing day which was fantastic. There were only a couple of hundred people there, we got to sit in the stands and it only cost 5€ to go in for the day! It´s a great day out if you love motorsport. Cool sign… I love it! You are most welcome, Diana.